Transient orca are a genetically distinct ecotype of the orca species. They are characterized by living in small matriarchal groups, typically consisting of a female and her offspring. Once offspring are of reproductive age, they may break off from their mother’s group and start their own family, or they may remain with their mother for the rest of their lives. Transient orcas are mammal hunters, with a diet that can range from seals, sea lions, porpoises, dolphins and occasionally other whale species. They typically hunt in groups of three to five, using stealth to surprise their unsuspecting prey. There are four distinct transient populations from northern Alaska to central California. Their home ranges expand several hundred miles, as they need to continually search for prey. The species that transients hunt are intelligent animals with acute hearing, so once transients are known to be in the area, their prey either spend most of their time on land or leave the location quickly to avoid being eaten. Transient orca are much less vocal than their relatives the resident orca, as being quiet improves their hunting success. 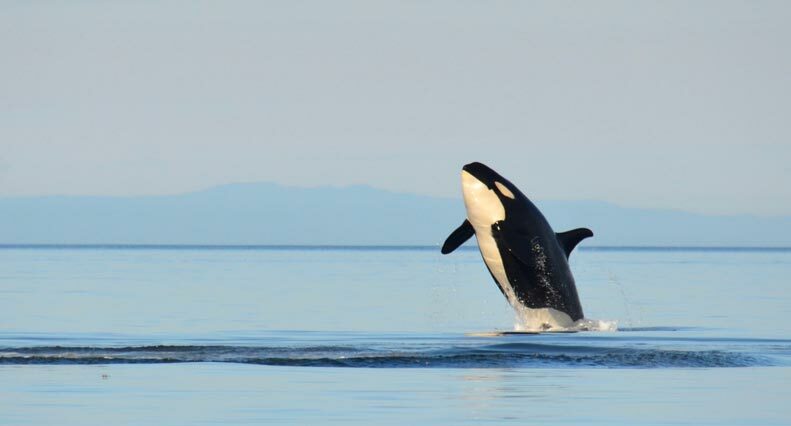 Transients will engage in playful behavior such as breaching, spy-hopping and tail slapping after they have made a kill and have full bellies. Transient orcas have closed or solid saddlepatches, which is the greyish-white pigmentation found on their back. The dorsal fins of adult male transients are very triangular and come to a sharp point at the top. Transient female dorsal fins are sharply curved and come to a point at their peak as well. Every orca has its own unique saddlepatch and dorsal fin, which allows us to identify each individual in a population. Transient orca do not socialize or mate with resident orca, nor do they display any aggression towards this other type of killer whale. Even though transients are mammal- eating orca, there has never been a reported case of an orca attacking a human anywhere in the world.